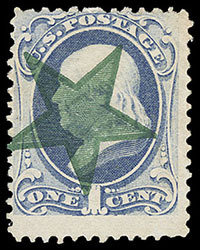 1881, 1¢ gray blue, re-engraved, near complete strike of green Printed Star Precancel of Glen Allen, Va, strong vivid color, faint corner crease at top right, a Very Fine strike, a very rare fancy cancel in green; with 2018 P.F. certificate. Scott No. 206 Estimate $400 - 600. 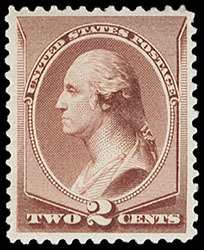 1883 Special Printing, 2¢ pale red brown, o.g., lightly hinged, beautifully centered amid well balanced margins, rich vivid color on bright fresh paper, Extremely Fine and choice; with 2000 P.S.E. certificate.